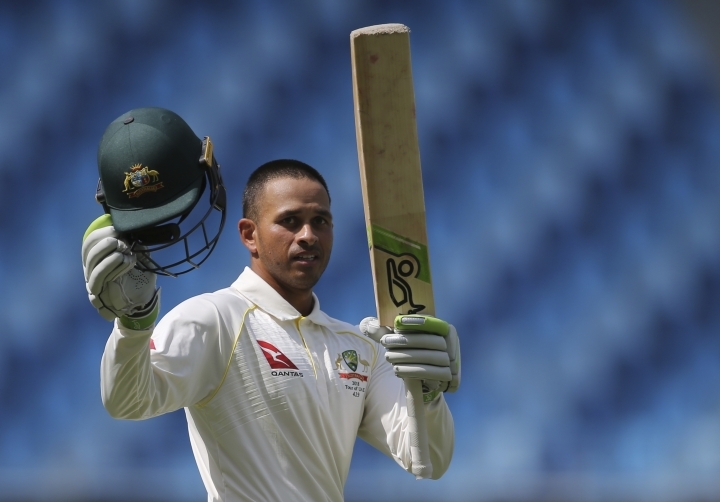 ABU DHABI, United Arab Emirates — Opening batsman Usman Khawaja is a doubtful starter for Australia's next series against India after injuring his left knee during the second test against Pakistan. Khawaja has not participated in the second test since he twisted his knee during a warm-up before the third day's play, and has been pushed down the batting order despite wickets falling in the fourth innings on Friday. In Khawaja's absence, Australia opened with Shaun Marsh after Pakistan setup a monumental target of 538 with six sessions remaining in the match. Scans showed a cartilage tear that could sideline Khawaja for up to eight weeks. He batted for more than 125 overs and scored 141 runs in the last innings of first test to help Australia salvage an unexpected draw in Dubai. Australia has struggled since then and after Khawaja was dismissed early in the first innings of the second test, Australia was bundled out for just 145 and conceded 137-run lead. Pakistan captain Sarfraz Ahmed also was sidelined at the start of play Friday after complaining of headaches. Pakistan team management said Ahmed was taken to a hospital for precautionary scans and Asad Shafiq led the team in his absence, with Mohammad Rizwan deputizing as wicketkeeper. Ahmed was struck near to his left ear as he tried to duck Peter Siddle's short delivery while he was batting on Thursday.